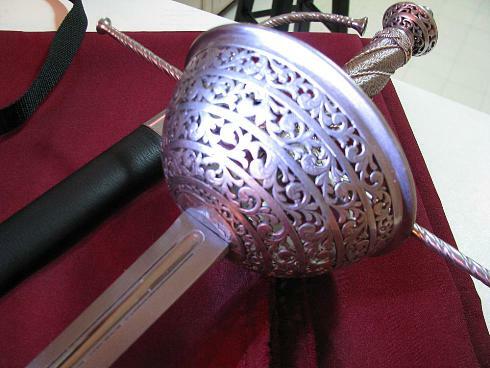 The Taza Cup Hilt Rapier by Hanwei is one of their most strikingly attractive swords. But the big question is, what does it REALLY look like in person, and how does it measure up - especially when you consider the new pricing pushes it far outside of the $300 price range most of it's contemporaries sell for? In this hands on review these questions, and many more, are answered once and for all. A few weeks ago, I got badly bitten by the rapier bug. 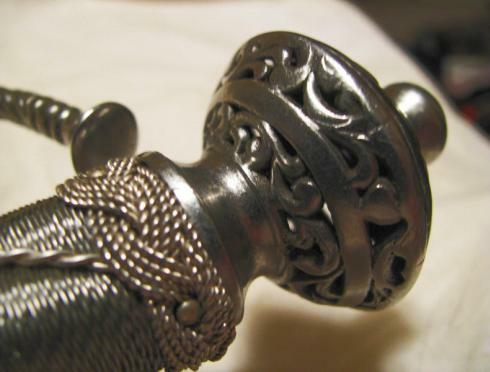 After spending a good bit of time looking about the web, I decided to buy the Hanwei Cup Hilt Rapier, a second rapier, and a good many books about rapiers and their use. (It was a really bad bite). 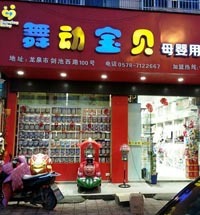 Right away, the Hanwei Rapier impressed me. 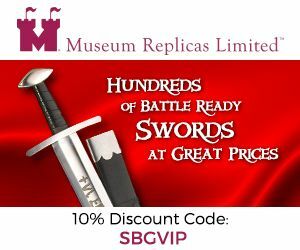 It is one of the best looking swords I have ever had a chance to examine. 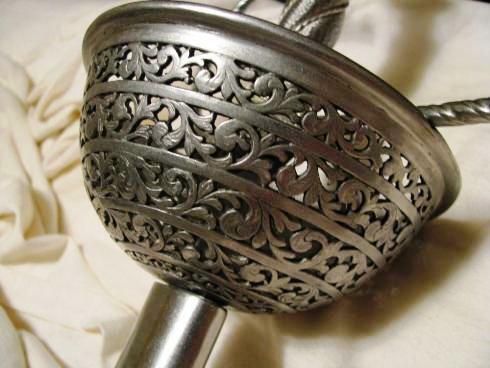 The detail work on the hilt is excellent and the handle and pommel are both gorgeous. 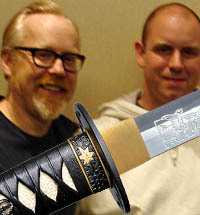 Let's start with a few details about this sword. 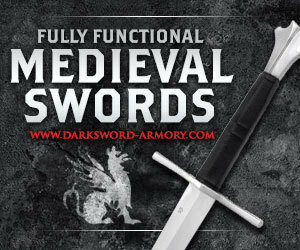 This sword was designed for thrusting (as all rapiers are), but also for light cutting. The first fourteen (14) inches are fairly heavy and blunt. Here, the blade shape is roughly hexagonal. 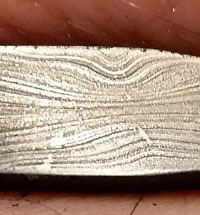 A 13.125 inch fuller begins at about a quarter of an inch from the guard and continues almost to the "transition point" (see below). This fuller is surrounded by an engraved line - filled haphazardly with what may be black enamel. 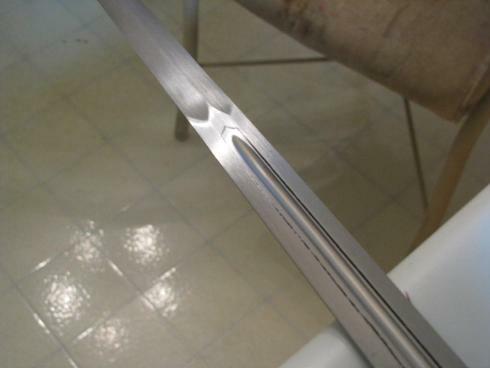 This is the only major cosmetic flaw on the blade, but there are several minor scratches. At the fourteen inch mark, we find the transition point. (I'm sure this has a fancy name, but I don't have a clue what it is.) 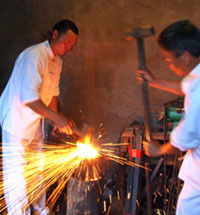 From here to the tip, the blade is diamond shaped and semi-sharp. This gives the user about twenty-four and one quarter inches (24 1/4) of cutting edge. The grip (of unknown material) is wrapped with fine wire and a set of twisted secondary wires, which spiral about it. 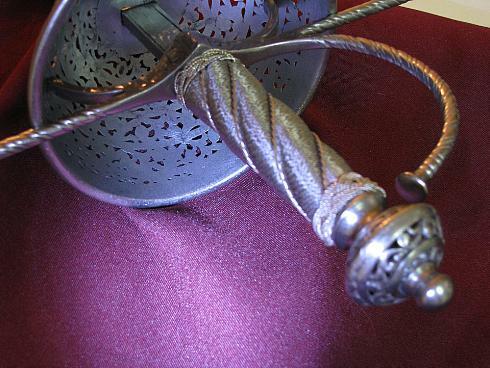 Each end is wrapped with Turk's head knots. I like this grip. It is comfortable to hold - both bare handed and with a glove. 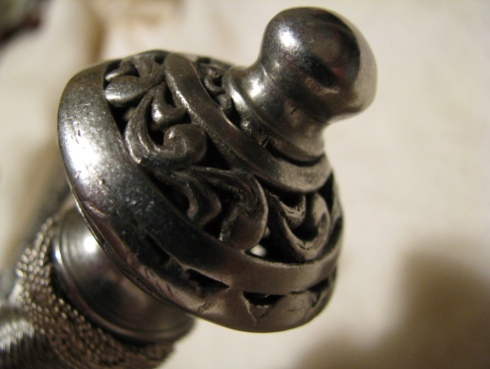 The hollow pommel is a miniature work of art. It is intricately detailed as can be seen in the photos. My guess is that it is cast, but this does not detract from its looks. The scabbard is wood covered with black leather. This is stitched on the back side in a diamond patter. Just beneath the throat, the leather is slightly puffy. The chape and the throat are of a non-magnetic, silvery metal. This could be stainless or it could simply be polished aluminum. The blade fits the scabbard in a lackadaisical manner. It rattles at the tip end but is fairly snug at the top. 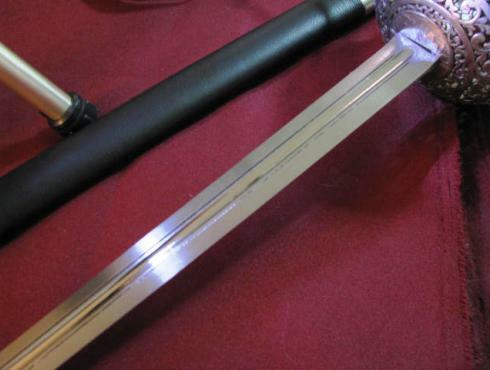 Turning the scabbard slightly upside down will drop the sword into your hand (or onto the ground). It is altogether unimpressive, but it is what one would expect in this price range. 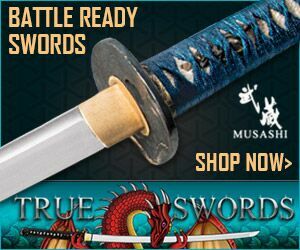 Thrusting is where this sword shines. 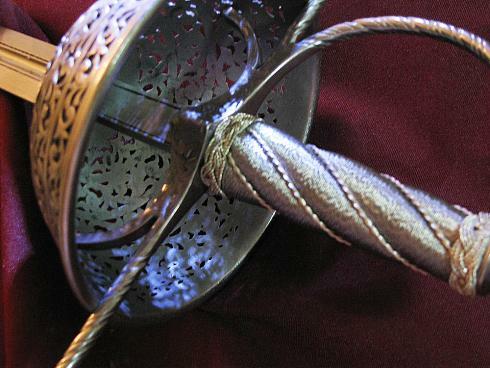 This is hardly surprising as rapiers were designed primarily as thrusting weapons. 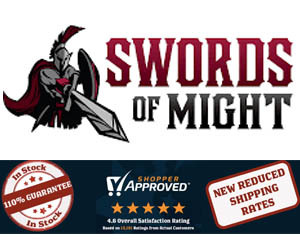 The sword made short work of water filled plastic bottles, and both wet and dry cardboard. Penetration of these targets seemed effortless. 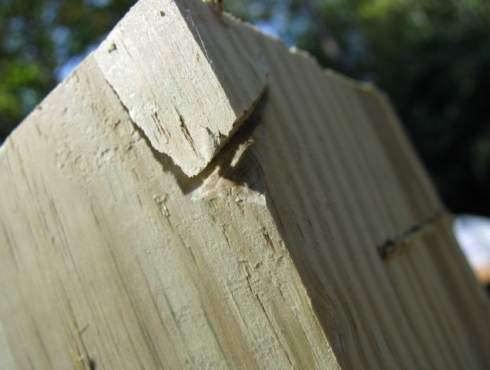 I did not try thrusting against plywood or other hard objects. I'm a bit leery thrusting into wood with a blade this thin. 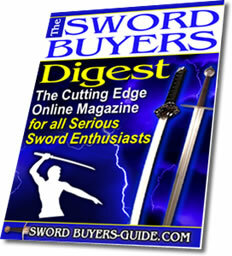 As can be seen in the video, as a cutter, this sword is a good thruster. Cutting is not its strong suit - especially in the hands of a novice like me. I was able to cut through one half-gallon milk jug and I made a rather impressive gash in the cutting stand when I totally flubbed a cut. On water filled bottles, I might as well have used a club. For me, the sword is very tip heavy. The only thrusting swords I have used before this were foils and epees. 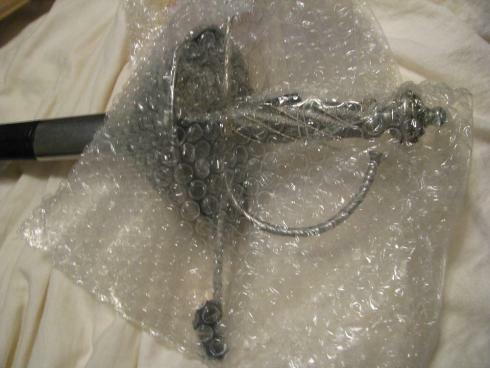 (My pistol grip epee weighs in at 13.7 ounces - less than half the weight of this rapier.) 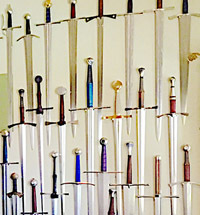 The point of balance on my fencing swords is close to the guard. That combined with the light weight makes tip control easy. In essence, the epee and foil act like sports cars where this handles like a full size pickup. 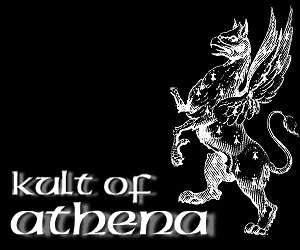 But, that is the nature of the beast. 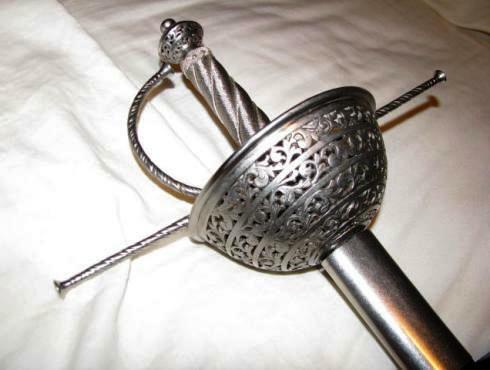 While I was not able to find a sword that matched this one exactly during any of my internet searches, the hilt appears to match the description of a type 100, in A. V. B. Normans "The Rapier and Small-Sword, 1460-1820". Despite the fact that I'm not any good with it yet, I like this sword. In addition, if I put my mind to it, I should be able to work my way up to a satisfactory level of mediocrity. It is simply a matter of getting used to the weight and taking the time to practice. 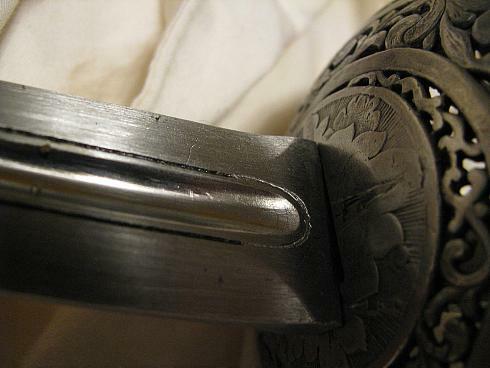 Like all the Renaissance Hanwei swords, this blade has gone the way of the do-do..